Tucker is ripping the cover off the ball ever since returning to AAA. His disappointing big league promotion is reminiscent of other elite prospects who needed more than one chance to erupt. The Astros future stud finds himself right back where he was previously, which means dominating AAA pitchers. This week all he did was rack up 6 HR and 3 SB while putting the bat on nearly everything. He clearly does not want to be in Fresno anymore, and neither do his dynasty owners. Tucker will be a beast in Houston very soon, and this performance leaves no doubt. Keller put together 11 scoreless innings this week on his way to taking home our #POTW award. The Pirates prospect utilized his new weapons to silence a couple of capable lineups, including the Columbus Clippers. He is yet to show the upside at AAA, but we all know what he possesses. He is progressing nicely in August with 27 K in 29 IP and a 2.17 ERA in 5 starts. 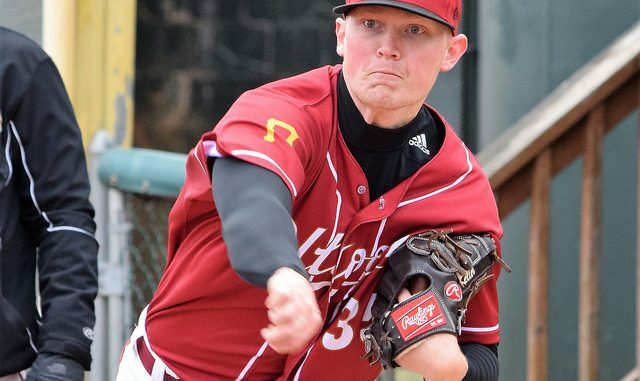 Keller looks to close out the year with a few more Prospect of the Week type performances to get rolling into the Pirates starting rotation in 2019. The big-bodied, left-handed masher put all of the power on display this week. Lester tied for the minor league lead in home runs this week with 6, which pushes his season total to 19. This is what the first baseman is known for, and he does not provide much upside elsewhere. Not what you would call a “true-three-outcome” player, Lester lacks approach but provided a ton of value for the Erie SeaWolves this week on route to his award. Dunshee continues to boost his prospect status with performances such as the one he provided this week. He is a cognizant pitcher who I just can’t seem to get enough of when researching prospects for dynasty leagues. The deep Oakland arm first impressed me when I came across his training videos, on YouTube, practicing newer techniques like tunneling and enhancing spin rate. This season he is consistently impressing at every level and is speeding past other arms within the system. Do not sleep on this exciting prospect, and oh yeah… he didn’t give up a hit this week. White just continues to hit. On the season, he is slashing .299/.365/.454 which is impressive for the 1st round pick out of Kentucky. The power is yet to develop fully, but this week shows exactly what the kid can do with a bat. Barrels to all parts of the field, a bit of speed, and counting stats will be prevalent for White throughout his career. Being a 1B prospect puts a damper on some studs. However, White should be on everyone’s radar for consistently hitting his way through the SEC and multiple levels of the minor leagues in consecutive seasons. Walker could be a late bloomer within the stacked Atlanta Braves system. The arms that they bolster in their minor league ranks are phenomenal. However, Walker does not find himself in any of their top tiers. This week he put on a performance worthy of winning this award with 14 strikeouts to 1 walk in 13 innings. The numbers were staggering, but his overall statistics this season still leave one wondering if this is legitimate or just another blip on the radar. Pratto is another prospect making the most of his first full minor league season. Everyone is talking about the Lexington Legends this season, and this 1st baseman is part of the reason. The Royals continue to impress in the draft and internationally by putting together an incredibly exciting farm system. Pratto provided a little bit of everything this week as he has all season. Power, speed, and positive approach at the plate are all attributed to Pratto’s prospect status. More performances like this to close out the season will cement him in our minds as a top prospect to watch for 2019. The 4th round pick for the Brewers in this year’s draft is slowly moving further onto my radar. The JuCo lefty is now performing much better in A-ball than he did at the rookie level. In 6 starts, he has 42:9 K:BB in 32.1 IP with a couple of beastly outings in a row. Including this week, Ashby now has 22 K in his last 12 innings, including one tough-luck loss against the Cedar Rapids Kernels studded lineup. Time to wake up on this mid-rounds pick and maybe look to snag him up at the back end of deep first-year player drafts this offseason. He already made the jump to A-ball with much success, next year could be a cruise. Finally, I am writing about a Spokane Indian NOT named Curtis Terry. Although Terry is making my radar screen go wild, Gardner hopped on this week with a powerful performance. The 9th round pick in last year’s draft, Gardner, has yet to perform up to any standard worth keeping an eye on for dynasty leagues. However, the Rangers take a ton of raw bats and turn them into something major league worthy. Gardner is a Texas native, so making it to the bigs in his home state is definitely something to root for. Strong is pitching exclusively out of the bullpen in his 2018 debut. That does not mean the prospect is performing to a lower level, but maybe this has to do with the Rays big-league, “bullpenning” strategy. Strong is a 10th round pick from this year’s draft and showcased a ton of strikeout upside this week. The right-hander is making his start at low-A and could potentially be a fast-mover in a relatively safe Tampa Bay Rays system. They are stacked with bats and arms that have everyday stud type upside. However, guys like Strong can sneak through the system and provide value to a continually developing rotation strategy led by the major league club. It’s hard to explain how much hype there is surrounding Kelenic at the moment. This high school bat had 1-1 rumors floating at multiple parts of the high school season but eventually fell to the Mets at an extreme value. He is doing nothing but raking since debuting. Since moving to the Appy League, Kelenic has an OBP 100 points higher than his batting average with 5 HR and 11 SB. The best part about his profile doesn’t show up in the stat-sheet, as his defense is known to be centerfield ready whenever he makes the bigs. Kelenic is a huge stud and should be drafted as such in upcoming first-year player drafts. It’s pretty clear that the 19 strikeouts are what gives Puello’s this weeks #POTW for Rookie ball. The 19-year old from the Dominican Republic struck out 27 batters in his last 17 innings while allowing only 4 walks. He is tall and built like a pitcher at 6’4″/185 lbs. The Cardinals are an inspiring organization to be in for a raw, international arm such as this one. Puello could surprise next year if he performs like this at the higher levels. The ceiling is unknown for this young prospect, but the Cardinals targetted him in this year’s signing period for a clear reason. Featured image of Mitch Keller – via Jeffrey Hyde on Flickr. You can also find him on Twitter @jeffhyde and on Instagram @milbgrammer.